Republican John Kingston announced his candidacy for the Senate in October. To get on the primary this fall, he needs the support of the state Republican convention, which has become increasingly conservative and pro-Trump. Two years ago, there was no more virulent anti-Trump Republican than John Kingston. But that was then. Now, as he courts the GOP’s support to challenge US Senator Elizabeth Warren, Kingston is trying persuade state convention delegates that he really was not in such a fury over the party’s nomination of Donald Trump. 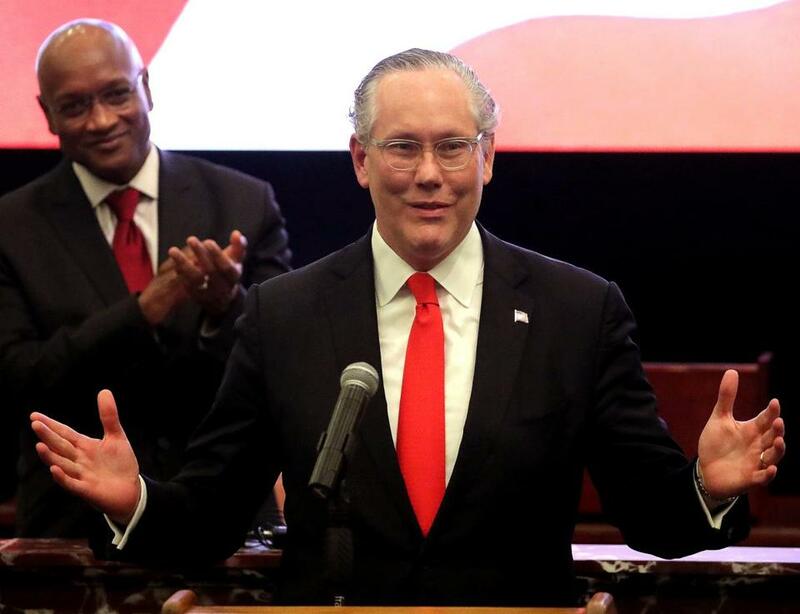 In his new version of his anti-Trump activities — which included spending $1 million of his money and tearing up his Republican Party registration in protest — Kingston concedes he “did not fully support” Trump. And, according to a letter sent to delegates this week, Kingston says he is now a solid backer of the president, proclaiming Trump has had “many” successes. “It is important for you to know that I support the President, and the Trump administration,’’ he wrote in his three-page appeal obtained by the Globe, adding that he attended the president’s inauguration with his son. A little history. In June 2016, just a month before the Republicans gathered in Cleveland to officially nominate Trump, Kingston funded the creation of Better for America, a group of establishment GOP conservatives who were looking to run a third-party presidential candidate with hopes of depriving Trump electoral votes — a move that, if successful, would likely have given Hillary Clinton a victory. Kingston’s didn’t hold back his contempt for the GOP’s presidential nominee. He even went so far as to blame him for destroying the Republican brand, and he attacked the GOP leadership for being afraid to stand up to the presidential candidate, claiming they were more concerned about getting run over by the Trump storm. In fact, he was so driven by his anti-Trump feelings, he changed his Republican registration to independent. He recruited a candidate to run as an independent, but to no avail, and eventually the movement fizzled. Now Kingston faces an April 28 Republican convention, a party gathering that has become increasingly conservative and pro-Trump. The predictions are that he will make the 15 percent threshold to qualify for the September ballot, but it may be close. Beth Lindstrom, a longtime activist in state GOP politics, and State Representative Geoff Diehl, a steadfast Trump supporter, are also running. So perhaps it’s no coincidence then that Kingston has changed his position on the president. And as for his political heresy two years ago? “At the time of the election, while I did not fully support candidate Trump, I did unequivocally stand against Hillary Clinton — as I always have!” he wrote in his letter.